Get complete data ownership, residency and control! Self-host it on-premises or on any cloud. Did you know? FileCloud is growing faster than Box or Dropbox! 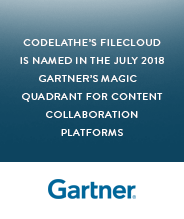 FileCloud Received 2018 Gartner Peer Insights Customers’ Choice Distinction for Content Collaboration Platforms. 92% of our customers are willing to recommend us. Run your own private Dropbox-like file sharing and sync solution, integrated with your IT infrastructure and storage. We host FileCloud for you on a world class infrastructure in the region of your choice. No installation. We take care of all the technical details. Run FileCloud on your infrastructure, with full control over your data. Customize all aspects of FileCloud, including login pages, emails, messages and newsfeed. Edit and Save documents directly from Word, Excel or PowerPoint.